This entry was posted in Movies and tagged August Rush Christmas Fairy tale Movie review New York City soundtrack on December 24, 2008 by Mario. Are you one of these people who always saying: ‘Oh, but this movie isn’t realistic. This can’t happen in the real world.’ If so, I’ll give you a tip: sell your TV and home cinema system on eBay. No, I am not trying to insult you, it’s just a good opener for this weeks review, because I recently saw a fairy tale mixed up in a 112 minutes music video masterpiece. Come on, it’s Christmas, don’t be realistic and sit down, cuddling with your spouse without breaking the remote control by sitting on it and enjoy this movie. The plot is as warm as your cacao and comes right out of fairy tale tellers heart. 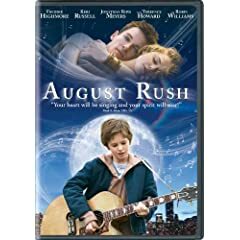 August Rush tells the story of two young musicians. The guitarist and singer of a rock band and the talented young cellist. They have just one romantic encounter at Washington Square in New York. The legacy of this night is a baby boy without the fathers knowing. The father of the woman makes her believe that she lost the baby when she has an accident. But baby Evan isn’t dead. Out of five stars, I give this movie 4,5 because of the awesome acting of the whole cast. The soundtrack is sublime. Especially the mixing of the classic and rock music when they show two concerts that take place at the same moment. Very enjoyable. I wish you a merry Christmas and hope you’ve enjoyed this movie. Reading your reaction, I guess, you did already. Hey… I’m an Indy girl. And, I have my entertainment equipment, for that purpose……entertainment!! What a concept!! Who would have thunk it?? If I’m not crying, laughing my booty off, feeling like throwing up, or feeling so uncomfortable, I’m speechless, then I didn’t see a “good” film.